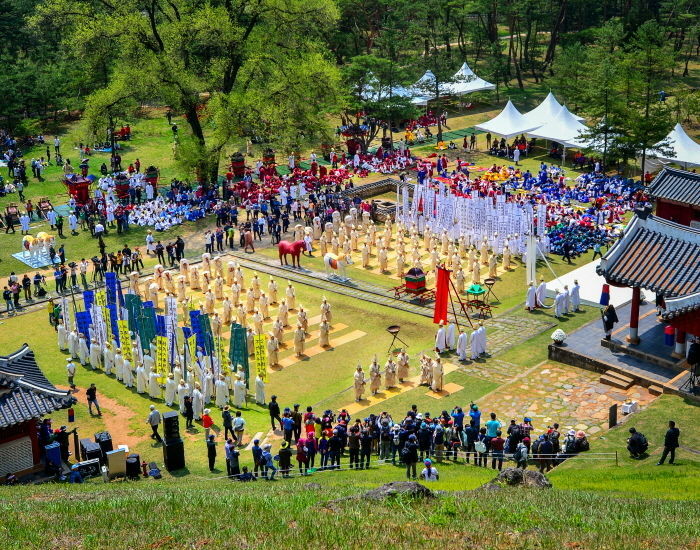 The Danjong Culture Festival, a major festival of Yeongwol-gun in Gangwon-do, is held around the Jangneung Tomb area. The festival is a historic cultural event held annually since 1967 in memory of King Danjong (the 6th monarch of the Joseon Dynasty) and his loyal subjects. It was originally called Danjongje and was renamed to Danjong Culture Festival in 1990. In the beginning, it was held for three days starting on the day before Hansik Day, which is April 5 by the Gregorian calendar, except in leap years (the 105th day after Dongji). Since this date changes every year, it was later decided that the festival should be held from the last Friday of April instead. From Seoul Express Terminal, take intercity bus to Yeongwol Terminal. From Yeongwol Intercity Bus Terminal, take a local bus or a taxi to the venue. Jangneung Royal Tomb, Donggang River area, etc.